Now that our days are once again filled with sun and heat, refreshing cocktails are a must. Licor 43 recently hosted a bartender competition in Boston and Josh Taylor of Westbridge in Cambridge, MA took top prize for his “Backyard Cocktail,” a creation that reminds him of what summer porch sipping is all about. The cocktail is a seasonal concoction of rhubarb shrub with strawberry and lime juices perfectly balancing the vanilla-citrus sweetness of Licor 43, a combination that captivated the judges and the members of the audience in attendance. To make this cocktail, the most difficult ingredient to source was the rhubarb for the Rhubarb Shrub. I suppose that is payback for the years I tried to kill off a plant when I didn’t know what it was, right? Typically not something available in abundance at our local grocery I was fortunate to find a stash at Sprouts and I could finally offer up a cocktail using the Licor 43 I received months ago! Shrubs are drinks that date back to Colonial days when they were made with sweetened vinegar fruit syrups blended with rum or brandy. Not to be confused with garden plants, their name is derived from sharab, an Arabic word meaning syrup, and sharbat, a Hindi word for an aromatic syrup made from fruit, or herb and flower extracts, that is stirred into water and served over ice. Today even the frozen treat called sherbet can be traced back to this word. Concentrated syrups similar to drinking vinegars, shrubs were especially valuable prior to refrigeration as another way to preserve perishable food items from the bounty of summer; allowing berries and stone fruits to be enjoyed during the winter months. They are a great blend of tart and sweet and were quite popular in the 19th century to flavor sodas and tonics until they eventually lost favor to commercially produced soda. All thanks to the resurgence of craft cocktails, shrubs are making a big comeback along with handcrafted bitters and cocktails using seasonal produce. The beauty of craft cocktails is that they can often be recreated at home with the right ingredients and a bit of time. This shrub was made from cooking the rhubarb on the stove-top, so even faster than other methods that require days of steeping. Licor 43 mixes especially well with the flavors of summer from rhubarb to strawberry to pineapple and citrus so it was the perfect fit for the combination of summer fruits and a bit of citrus. Crafted in the ancient Spanish city of Cartagena, Licor 43 is a versatile sweet liqueur with notes of vanilla, citrus and orange blossom. Made from 43 ingredients in a millennium-old recipe known only to three members of the Zamora family, Licor 43 has a seductive bouquet, a gorgeous gold color and a lushness that speaks of the spirit of Spain. I often make cocktails that just sound good and plan to develop a post about them. I just as often cross my fingers that I will actually like the cocktail and I’ve been VERY lucky; few fail. But there is always that moment and in this case that moment wasn’t until after I had done ALL of the work, including photos. Considering I’ve never really loved rhubarb this was a huge leap of faith…so I’m wondering if you heard me squeal in delight. This is SO good; absolutely outstanding. You did good Josh; I see why you won. Sort of a grown up strawberry-rhubarb pie, this cocktail is perfect for warm weather imbibing! Easy and seasonal; the perfect cocktail for right now! 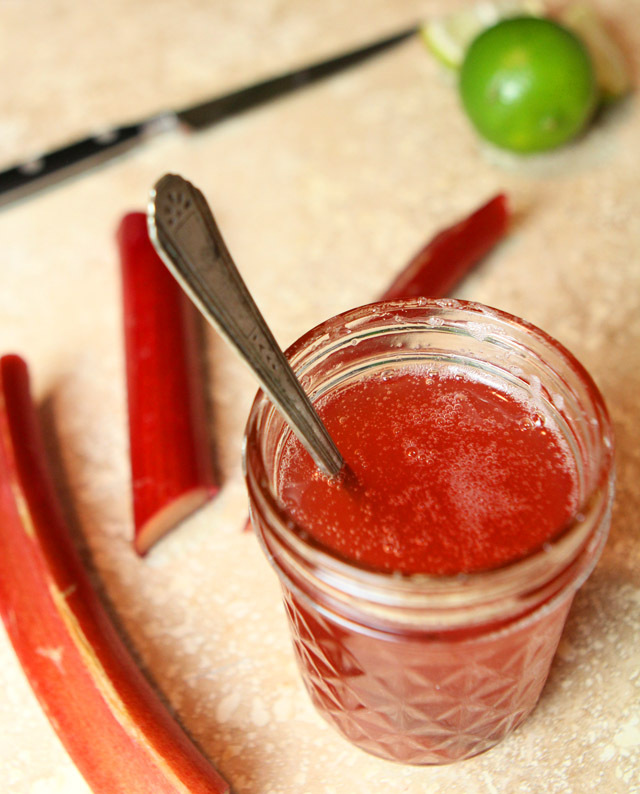 Combine the rhubarb, apple cider vinegar, and granulated sugar in a small saucepan over medium-high heat, stirring as the rhubarb begins to break down. Bring to boil and then educe heat to low and cook until the rhubarb is completely broken down into strands, about 10 minutes, stirring occasionally. Remove from heat and pour into a colander or fine mesh strainer lined with a layer of cheesecloth. Stir the mixture gently once or twice to help it strain, but do not press it through the cheesecloth. Discard the solids. Pour the resulting syrup into a jar and let cool to room temperature. 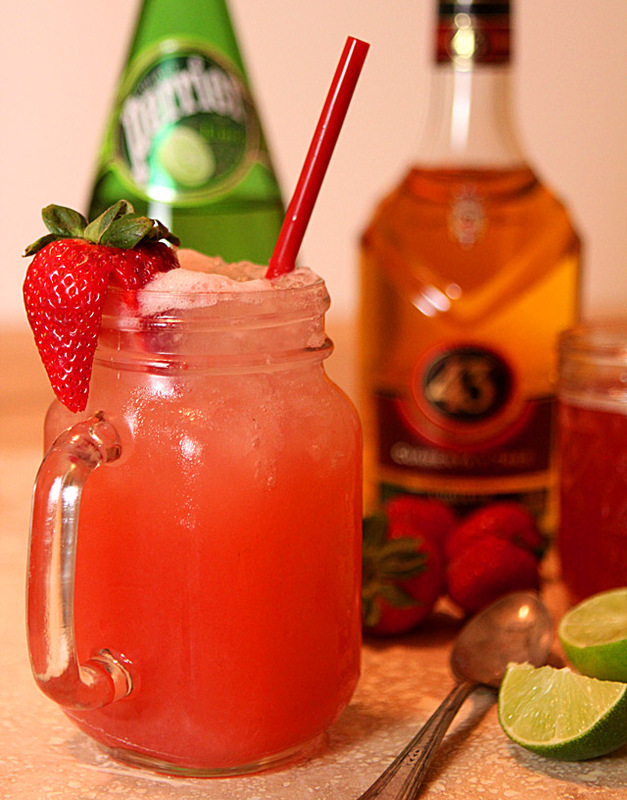 Combine the Licor 43, rhubarb shrub, strawberry juice, and lime juice in a cocktail shaker and shake lightly. Strain into a highball glass over ice. 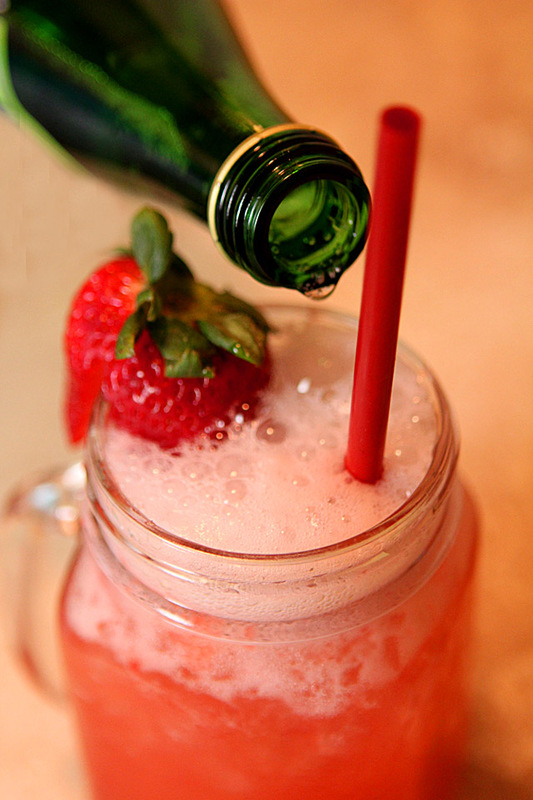 Top with club soda, garnish with a whole strawberry and serve with a straw. Hi .. curious to know what is Licor43.. and what does it taste like? Wikipedia does a great job of explaining it Julie. I had the unopened bottle for several months and glad I tried it now; the flavors were perfect a drink meant to be a refreshing libation redolent of summer. The ‘Backyard Cocktail’ – Rhubarb Shrub, Strawberry, Lime and Licor 43 make for a winning cocktail in a Boston bartender competition. Love Love Love… this photo. Haven’t tried the recipe yet, but its on my list for next weekend, but knowing the way the work week can go sometimes, maybe i’ll get to it sooner lol. Cheers! Thanks so much Alex; the food and cocktail preparation I’ve got lots of experience with. The photography part is newer and kind comments are so appreciated! As I am not a huge fan of rhubarb, I was delighted to read that you are not either but that you did enjoyed this cocktail. I just may as well. It certainly is enticing looking, so full of summer. Thanks for the information about the origins of Shrub Drinks. Always learn something new here. I had that liqueur far too long Stacy to not have tried it…and it is a winner! A liqueur that starts with the word Biscotti? Well, now I think I must have that! I’ve been thinking about shrubs lately! I’ve never made one, though I’ve read about them for years. Rhubarb sounds brilliant! And the color is wonderful. Glad this turned out! Thanks. It was a HUGE leap of faith and one I’m glad I took; now I want to make more of them. This might be the ‘year of the shrub’ in my kitchen! Thank goodness for your cocktails to remind me that it is indeed Friday again! I like strawberry and rhubarb pie so this drink sounds just right to me. Only question is– my backyard or yours? Backyard drinks sound perfect for sharing! Karen does have a lovely backyard and you are welcome anytime! It was amazing; to think I’ve had that liqueur on hand for months and had not opened the bottle. Bad Barb! I’d stay in the back yard for this. It sounds lovely! I’ll make the cocktail; all you have to do is make the trip! This is just what I need for my front porch neighbor observation sessions this summer. I’ll trade you some of my lemon ginger syrup for some of your rhubarb Barb. Oh, that sounds like a new drink. The Rhubarb Barb. Get to work on that girl. I’ll be your taste tester. The Rhubarb Barb? Does sound catchier than the Sour Cherry Barb doesn’t it. I made your lemon ginger syrup. I could eat it all by it’s lonesome it’s SO good!